Serves 1-2, depending on what else is served at the same meal. 1 large, round or 2-3 small, fresh eggplants. Try to get ones with thin skins. 3 Tbs. miso. Here I've used a haccho miso (八丁味噌）with some texture to it, but any miso you like will do. See Japanese miso primer. If you're using a big round one: Cut off the blossom end, and reserve to use as a decoration. If you're using a small thin Asian-type eggplant: Cut in half lengthwise, keeping the blossom end on for decorative purposes. Rub the cut surfaces of the eggplant with a little sesame or olive oil. Roast it in an oven at 200°C / 400°F, cut side down and tented with some loose foil until tender (the time depends on the size of the eggplant, but it's about 10 minutes for a small eggplant, 30 minutes for a big eggplant, with the slices somewhere in between). It's tender when you can pierce through easily with a skewer. You can try cooking the eggplant in a toaster oven too, but I haven't tested this myself so you're on your own as to timing and so on. Alternatively, you can slow-roast the eggplant in a dry frying pan. Place cut-side down in a non-stick pan, and cover loosely with some aluminum foil. Pan-roast until tender over medium-low heat, turning once. This method is especially suited for small eggplant - it takes 5-10 minutes and doesn't heat up the kitchen as much as the oven method. While the eggplant cooks, prepare the dengaku sauce. Combine all the ingredients in a small pan, and set over low heat. Mix the sauce vigorously with a wooden spoon, until the sauce turns glossy. Adjust the consistency by adding drops of water. It should not be too runny, but should flow thickly, rather like a thick ketchup. Serve the eggplant warm, coated with sauce. Dengaku (田楽 - the characters mean 'rice paddy' + 'harmony' or 'music' or 'play') is a classic miso based sauce. There are many variations, but the basics are the same: miso with sweetener, a little oil for adding gloss, and sake and/or mirin for added flavor. Sometimes a little soy sauce is added, or dashi stock instead of water, or even MSG. My version comes from my mother, of course, and is quite simple. You can make dengaku sauce in quantity and keep it in a closed jar in the refrigerator, but I don't bother since it's so easy to make fresh. If you do make it and store it, warm it up a bit before using. Dengaku sauce is terrific on other grilled or roasted vegetables, firm tofu, blanched konnyaku, and so on. It's a bit sweet for my taste for serving on meat and fish, but you can try it out! Add spice to dengaku-sauced foods by sprinkling on some shichimi tohgarashi (7-ingredient pepper, see Essential staples of a Japanese pantry). You might be thinkng, "But Japanese eggplants are small and thin and cute!" Well the standard ones are, but in Kyoto (the home of Japanese haute cuisine) there is a variety of eggplant that is similar to the one in the photo called kamonasu （賀茂茄子）- big, round, and quite thin-skinned. Here's a photo of one. Submitted by maki on 2009-08-14 09:02. Glad to see more posts, Maki! Thank you for this recipe. I love this dish but most recipes specify frying, which I dare not do much of. Definitely buying some eggplant tomorrow at the market. oh my this looks really amazing!! i love the color of this nasu really bright and fresh!! And then within days of each other you publish two of them! The last was your own mother's "saba no miso ni" - I haven't had the chance to make it yet, but I'm so thrilled and grateful that she allowed you to share it with us. And now this one for nasu no miso dengaku. Happily I just happen to have all the ingredients to hand for this one so this will be this evening's meal. So strange I was just thinking how nice it would be grill some eggplant for a BBQ I am having on Saturday, and here on your site is a lovely looking eggplant recipe. Though I will have to stick to my house special for the BBQ, I will definitely have to give this one a try while it is in season. Thank you for this recipe - the sauce sounds divine and addictive. 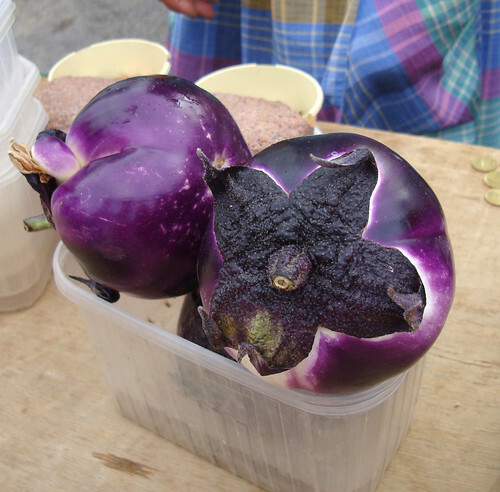 I am always looking for different ways to prepare eggplant, especially now with all the varieties appearing in the farmer's markets. Ahh... I love nasu dengaku! 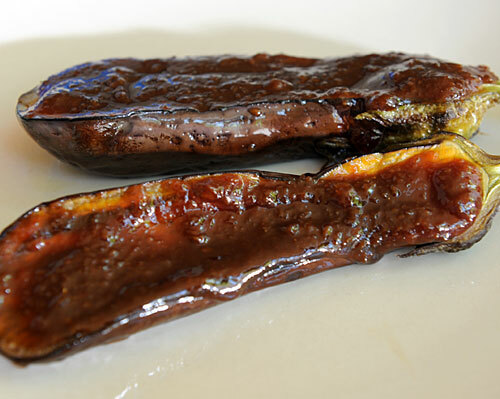 It's especially good if you use a broiler to lightly cook the dengaku sauce after you place it on the eggplant. It gets all carmelized on the sides, and warm and gooey in the middle... Heaven! Just what I'm looking for! The perfect way to use the eggplants I just got at the farmer's market. OMG, that sounds delicious...and now thanks to you I can point and laugh at my uncle. (lol) He is one of those "i'm always right" people... A while back he bought a bunch of stuff at the amish auction here in Indiana, and amongst those things was a huge small catanloupe sized round eggplant. He was like "I've never seen one like that" (He got it for me, as he doesn't like the stuff.) I told him that there were a lot of variety of eggplant, that there wss one hybrid that they grew round and could be picked at about the size of goose eggs or even to grow as big as the one he got and that I thought they were from asia and he swore up and down that NOOOOOOO asian eggplants were long and thin like a small zucchini or yellow squash. 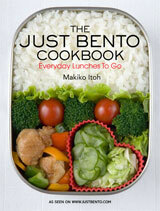 Thanks, Maki, for another wonderful recipe! Just wondering though: wouldn't the blossom end of the eggplant be the end the blossom grows out from? The part you used to garnish in the photo is the stem end, the opposite of the blossom end. hi! looks sooooooo delicious! 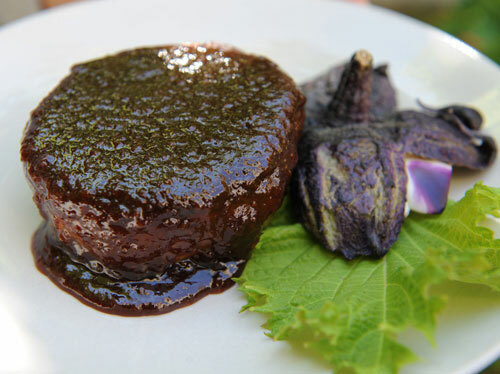 what is next to the eggplant in the photo, covered in the dengaku sauce... is that a type of meatball? or is that more eggplant? if it is a meatball/other type of ball, could you share the recipe? i can't wait to try this, YUMMMMMMM! If you are talking about the first photo, it seems to be a thick eggplant slice. I'm not sure exactly what it is, but it sure looks good. I will give this to my wife and we will try it. Food is a wonderful part of life and new recipes must be tried. "I’ve gotten some notes from people [...] about the miso flavor being too strong. The key here is the saltiness of the miso you are using. If it is a very salty type, you will want to cut down on the amount of miso - even down to 1 tsp. [...] rather than 1 Tbs. Taste your miso - if it’s mild enough that you can probably eat it as-is, or maybe spread on a slice of cucumber (one of my favorite snacks, by the way) then use the amount specified. If it’s too salty, cut down on the amount." Of course, as long as people taste before blindly adding an ingredient in, that usually saves it from being too salty, but for those who don't use miso regularly and aren't sure of the proper strength, I thought the above comment was a very useful note. Thanks so much for making me an eggplant lover! my mother used to cut the eggplants into thin slices and sauté them with some pepper/salt and olive oil. i haven't found another eggplant dish quite like that ever since; i really need to try this! Hey there.. I just made this recipe and even though I used red miso (which is actually a light to medium colored brown), my sauce came out very light colored and very salty. Any tips? You probably had a rather salty miso, so you may want to try another one, or alternatively try using less miso and some soy sauce (which will darken up the sauce a bit too) and a bit more sugar. I made this tonight and it was my first time making dengaku sauce. I loved it! I am Japanese American but tend to be quite intimidated by cooking Japanese food. Thank you for breaking it down for us here - delicious results! I used to love this at my two favorite restaurants and when I made it myself. But I moved and forgot about it. Thanks for the reminder.